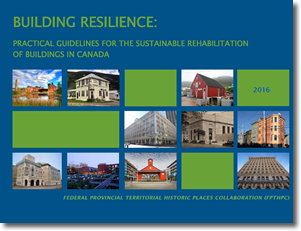 Building Resilience: Practical Guidelines for the Sustainable Rehabilitation of Buildings in Canada (PDF), is a new publication produced through the Federal/Provincial/Territorial Collaboration on Historic Places in Canada, which promotes how the conservation of heritage buildings can contribute to energy efficiency, sustainable development and achieving provincial environmental policy initiatives. Building Resilience is a pan-Canadian “how-to” approach for practitioners, design professionals, building owners and officials responsible for built heritage at all jurisdictional levels. informs and educates other sectors (e.g., development / real estate) on the environmental benefits of building conservation (as compared to erecting new buildings). Building Resilience is a standalone document, but it can also complement and supplement the Standards and Guidelines for the Conservation of Historic Places in Canada.